Maintaining good cashflow is absolutely critical to any business, especially if you have large, slow paying customers. Now you can make automate many of the tasks involved in this part of your business. Why is invoice trading the smart way to grow and who offers it in Australia? Great to see real progress this year in raising awareness of invoice trading. We operate the only confidential invoice trading platform in Australia. Our growing business customers love using our service and our investors are happy. That makes us happy too! In a recent article, AltFi investigated what’s happening in the Alternative Finance Market in Australia. What emerged is that the AltFi revolution seems to have started approximately when Matt Symons and Greg Symons founded SocietyOne in 2012, the first fully compliant peer-to-peer lending business in the country. That research focused mainly on peer-to-peer lending and equity crowdfunding. Although these two subsectors are key pillars of the broader alternative finance spectrum, we believe that invoice financing also deserves the same attention. First and foremost, it’s crucial to state the difference between invoice financing and invoice factoring, as they aren’t the same thing at all. The main difference between these two forms of financing is obvious. In the first case, the business owner is still responsible for collecting outstanding money owed by his/her clients. In the second case, clients will deal with the factoring company to make their payment, not the business owner. In Australia, from what we can establish, the top 5 Australian invoice financing/factoring platforms are Waddle, Marketlend, Timelio, FundX and InvoiceX. Waddle: Founded in July 2015 by Leigh Dunsford and Simon Creighton – owners of invoice factoring company Trade Advance – Waddle is an invoice financing platform, which has provided about 20 Australian SMEs with approximately $1 million in financing to date. In a recent interview, Leigh was keen to highlight that Waddle is no ordinary invoice factoring company. The platform offers a solution similar to factoring in some ways, but very different in others. As with factoring, Waddle provides funding against small businesses’ outstanding invoices. Unlike factoring solutions, businesses’ clients are never contacted or hassled by Waddle and entrepreneurs are able to skip on the paperwork headaches that historically plague the factoring process. Marketlend: Founded in December 2014 by Leo Tyndall and Paul Roffey, Marketlend was conceived as a business peer-to-peer lender, offering loans to businesses in the form of working capital, traditional business loans and commercial property finance. Its offering includes three products: a debtor finance product, an invoice financing solution and a trade finance service. In the case of invoice financing, loans are secured by a personal property interest over the borrower’s company and the platform owns the supplies as it pays for them; in the case of the debtor finance offering, they are secured against the borrower’s accounts receivable. To find out more about Marketlend click here. FundX: Based in Sydney, FundX was founded by David Jackson – former Australian small business builder and investor. According to him, the primary aim of the company is to connect businesses with investors who can fund their cash flows. Users are provided rapid access to funds based on the value of their outstanding invoices. FundX uses big data, machine learning and predictive algorithms to analyse risk and authorise invoice funding “with the push of a button, in less than a minute”. InvoiceX: Founded by Dermot Crean and Steve Yannarakis, the company is strongly placed to help small and medium enterprises (regardless of their business sector) to deal with working capital pressures. Its primary product – the Match Maker Trading Platform – rapidly matches investors with businesses, optimising the deal for both parties. InvoiceX assures the total absence of set-up fees and a straightforward application process. The company aims to provide a cash advance – up to 85% of the Face Value of an invoice – within 24 hours. Timelio: Founded in 2014, Timelio – formerly known as InvoiceBid – enables businesses to raise short-term finance by selling their unpaid invoices directly to a network of investors. The platform requires investors to fund their accounts with a minimum of $25k. Before being approved to sell invoices on the platform, all invoice sellers undergo a rigorous credit assessment. The platform states that third party analytics and searches might be used to further support the internal assessment. Before being made available for investment, each invoice and debtor will be verified and authenticated. Timelio has been recently awarded the “Game Changer of the Year Award” sponsored by Visa and the “Overall Award for Outstanding Excellence” sponsored by Optus at the OPTUS My Business Awards in Sydney. If you want to know more about the alternative finance space in Australasia, be sure to book your tickets for the AltFi Australasia Summit 2016 before they sell out. Lending money is easy. Lending money well is much harder. But for me the most important point came in a comment from LendInvest’s boss Christian Faes following the announcement of his excellent results. Christian observed that “the world of P2P is a slightly bizarre one in that there’s a lot of talk about how much platforms are lending. But for the industry to mature, investors should start looking at how viable underlying business models are, rather than simply how much a platform has lent. And what’s true of alternative finance is also true of virtually any disruptive business sector transformed by technology. Bet on profitable businesses with sound business franchises where the revenue lines are transparent and obvious. For the past few years, economists and policymakers have assumed that a lift in non-mining business investment was forthcoming. A trawl through RBA documents and speeches shows that policy officials have been anticipating a lift in non-mining investment for a few years. And yet despite incredibly low interest rates and a significantly lower AUD, the lift remains elusive. It has felt a lot like waiting for Godot. 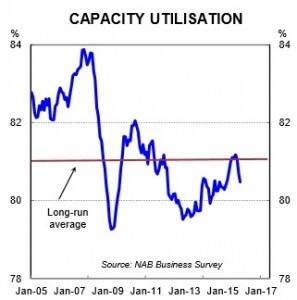 Fortunately, however, there has been a greater than expected pickup in services activity which has generated a fall in the unemployment rate despite weak non-mining capex. This has supported the economy and employment growth over the past two years. But for the productive capacity of the economy to lift over the longer term, a lift in business investment outside of the resources sector. 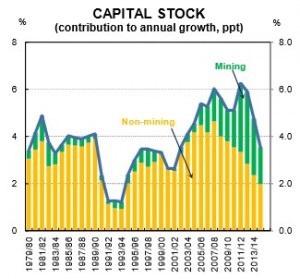 In this note we ask the question why non-mining business investment has been so weak. Monetary policy has been overburdened for too long… Indeed, record low interest rates have been assumed to be the panacea to get non-mining investment going. But monetary policy can only do so much. The interest rate lever can help smooth out the business cycle. But it cannot do anything to change the more entrenched and structural impediments to growth which are primarily related to the inefficient allocation of resources. Business ownership is becoming less common at younger ages - could it be a funding problem? The proportion of those aged 25‑34 who owned a business declined between 2006 (8 per cent) and 2011 (7 per cent). The largest proportional decline in business ownership was for those aged 35‑44, while business ownership increased for those over 65. It is widely acknowledged that the Australian population is ageing (PC 2013a; Commonwealth of Australia 2015) and similar ageing trends have been observed for business owners. The average age of Australian business owners has increased (by one year between 2006 and 2011) to 47 years, in comparison to the broader workforce where the average age of 40 years has remained unchanged over the same period. Nearly 10 per cent of business owners are now beyond the traditional retirement age of 65 and another 20 per cent are within 10 years of the retirement age. The Australian Government asked the Productivity Commission to undertake a public inquiry into barriers to setting up, transferring and closing a business and identify options for reducing barriers where appropriate. The inquiry report was handed to the Australian Government on 30 September 2015 and publicly released on 7 December 2015. It deals with the key drivers of business set-ups, transfers and closures. 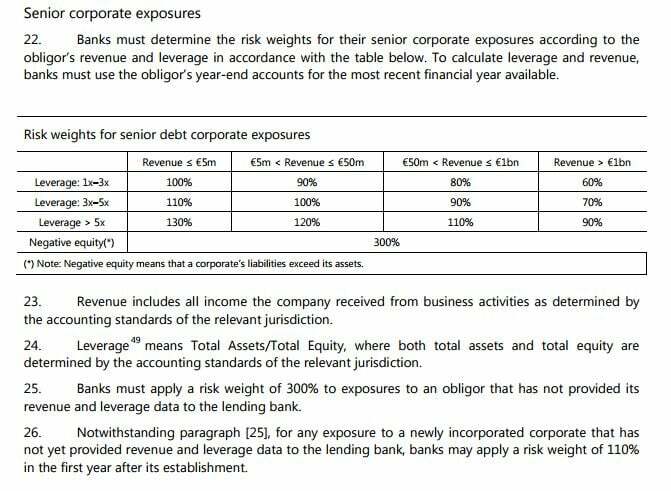 Invoice trading platform InvoiceX publishes its loan book as part of its plan to boost transparency. Australian online invoice trading platform InvoiceX today announced the publication of its loan book, containing tons of data on more than $6.5 million of invoice trades from November 20th 2014 – when the platform launched – to 31 December 2015. According to the data, the company is on track to trade over $50 million worth of invoices in 2016. Founded by Dermot Crean and Steve Yannarakis, the company is strongly placed to help small and medium enterprises (regardless of their business sector) to deal with working capital pressures. Its primary product – the Match Maker Trading Platform – rapidly matches investors with businesses, optimising the deal for both parties. InvoiceX assures the total absence of set-up fees and a straightforward application process. The company aims to provide a cash advance – up to 85% of the Face Value of an invoice – within 24 hours. Since inception, InvoiceX has facilitated 201 trades for SMEs with an average trade face value of $33,098, an average discount fee of 1.2 per cent per calendar month and an average settlement period of 35 days. The platform is keen on highlighting the differences between its business model and a normal factoring provider. Traditional factoring involves long lock-in periods, much higher costs and the losing of control of sales ledgers and collections. Conversely, InvoiceX’s product is totally confidential, with no lock-ins and a good deal of flexibility. It’s widely acknowledged that transparency is a key pillar of the Alternative Finance Space – essential to ensuring the sustainable growth of the asset class and to demonstrating that alternative finance platforms are behaving responsibly. 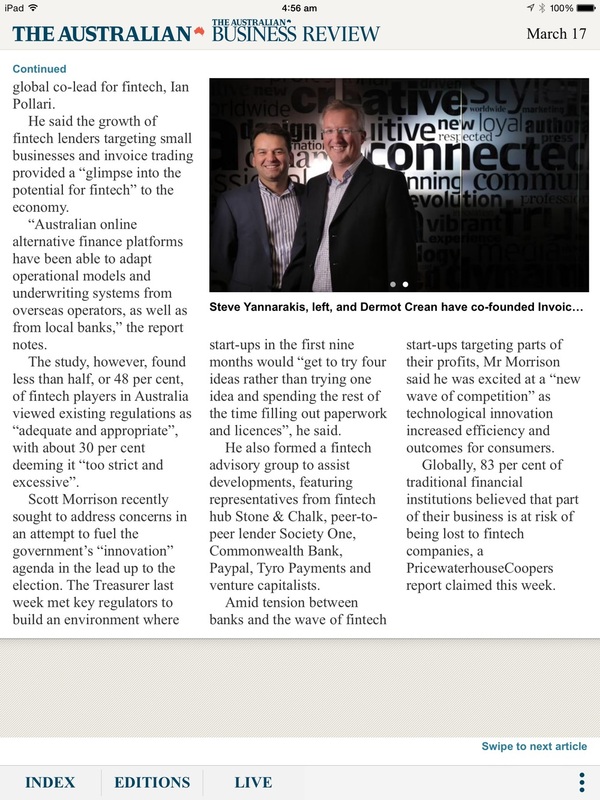 InvoiceX claims to be the first P2P Australasian platform to publish its loan book. 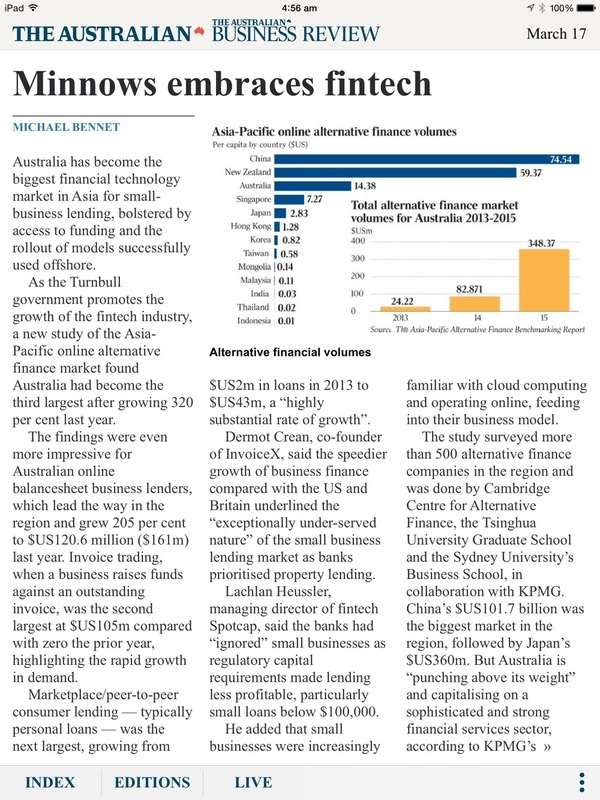 “It's great to be the first to do this ever in Australian SME finance,” said Dermot. RateSetter Australia, following in the footsteps of its UK-based progenitor, uploaded its complete loan book online last October – although this resource is updated on a quarterly basis. On a global scale, many players have already disclosed their data, including the likes of Zopa, Funding Circle, RateSetter and MarketInvoice in the UK. Aside from increasing the public’s opinion of the sector, data is critical also from a practical perspective, allowing for the construction of indices, such as the The Liberum AltFi Returns Index (LARI), which will likely come to form an essential component in the maturation of the sector. AltFi Data today added an Australasian section to its Resources page, providing a link to the InvoiceX loan book, which is accessible here. We suspect that InvoiceX may have company in the Australasian section before long.